It’s not often that one can point to a physical object at a specific geographical location in the contemporary world, and identify it as being the focus of a biblical prophecy that was written long before Christ. Yet, that is exactly what we can do in the case of a remarkable manmade edifice in Egypt that didn’t exist until 1970. It is a 230-foot tower, called the “Lotus Tower,” because it is topped by the five petals of the lotus blossom. The tower was designed as a token of Arab-Russian friendship, its five petals perhaps signifying the five pillars of the Islamic faith. It is only 49 years old, yet Ezekiel referred to it by name … twice. In the 29th and 30th chapters of his prophecy, “the tower of Syene” is mentioned as a landmark that is specifically related to the fulfillment of latter-day prophecy. In fact, this prophecy is profoundly powerful, sounding the death knell of Egypt. We have written about the current crisis in Egypt, which began with street riots in 2010, followed by Hosni Mubarak’s resignation early in 2011. This was followed by another coup, the assumption of power by the Muslim Brotherhood and more Islamic riots, finally resulting in the rise to power of Abdel Fattah el-Sisi in June of 2014. Egypt, like other countries in the Mideast, continues to experience uprisings and internal dissent. As this is written, war clouds surround Egypt in every direction. In this context, we have long studied a graphic prophecy in Ezekiel 29 and 30 that summons up the dark vision of Egypt’s future destruction by a great flood, which itself, is linked to a number of end-time prophecies. “6 And all the inhabitants of Egypt shall know that I am the LORD, because they have been a staff of reed to the house of Israel. 7 When they took hold of thee by thy hand, thou didst break, and rend all their shoulder: and when they leaned upon thee, thou brakest, and madest all their loins to be at a stand. 8 Therefore thus saith the Lord GOD; Behold, I will bring a sword upon thee, and cut off man and beast out of thee. 9 And the land of Egypt shall be desolate and waste; and they shall know that I am the LORD: because he hath said, The river is mine, and I have made it. 10 Behold, therefore I am against thee, and against thy rivers, and I will make the land of Egypt utterly waste and desolate, from the tower of Syene even unto the border of Ethiopia. 11 No foot of man shall pass through it, nor foot of beast shall pass through it, neither shall it be inhabited forty years. 12 And I will make the land of Egypt desolate in the midst of the countries that are desolate, and her cities among the cities that are laid waste shall be desolate forty years: and I will scatter the Egyptians among the nations, and will disperse them through the countries” (Ezek. 29:6-12). For a time, Egypt joined the legions of Islamic terrorists bent upon the annihilation of Israel. Currently, Sisi’s administration has stabilized the situation. But in the days ahead, such militancy is bound to spread like wildfire, finally arriving at a critical mass, at which time the Brotherhood will believe that it has arrived at a historic moment. Then, it will launch its invasion against Israel. Many object to interpreting the above passage in Ezekiel 29 as being an end-time prophecy. They say that the context of this chapter took place in the past, during the days of the Babylonian captivity. In fact, it may be partially interpreted in that way. But the very nature of Ezekiel’s words, places the final outcome of the Syene prophecy in the last days. Egypt has never been desolate and uninhabited for any 40-year period, as described above. 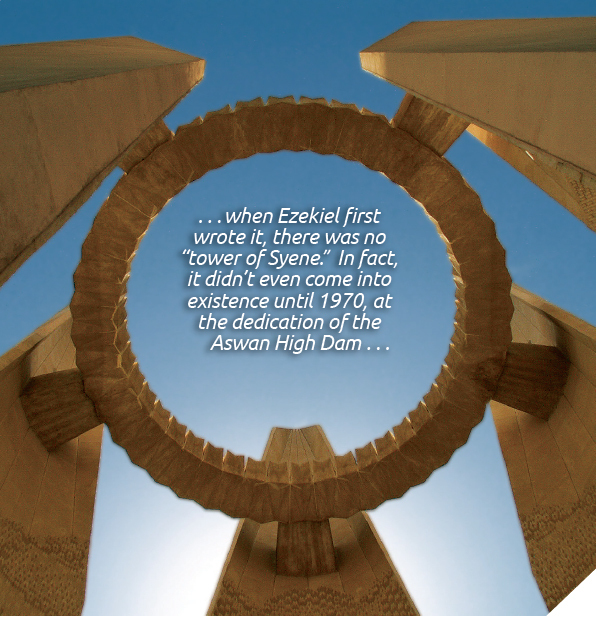 Presenting its self-evident truth, this prophecy must be contemporary in nature, because when Ezekiel first wrote it, there was no “tower of Syene.” In fact, it didn’t even come into existence until 1970, at the dedication of the Aswan High Dam, spanning the Nile at the location of the first cataract, Egypt’s southern border. The proper noun “Syene,” from the Hebrew S’veneh [vbux], means “opening,” or “key.” This name is said to be the ancient designation for the opening to Egypt, as one approaches from the south, or from the direction of Ethiopia. From several sources, it is quite easy to confirm that the biblical Syene is really Aswan. One of these is the Keil & Delitzsch Commentary on the Old Testament, first published in 1866. It affirms the connection, from the Greek Septuagint: “[Suhnh], Syene, in the inscriptions according to Brugsch [was] the most southerly border town of Egypt in the direction of Cush, i.e. Ethiopia, on the eastern bank of the Nile, some ruins of which are still to be seen in the modern Assuan (Aswan) …” (Vol. 9, Ezekiel 29-48, p. 8). When Keil and Delitzsch wrote their commentary in 1866, there was not a trace of the prophesied tower at Aswan. And when Ezekiel wrote his prophecy around 570 B.C., there was no tower. In fact, until the huge hydroelectric project was completed there, by the Russians and Egyptians in 1970, there was no tower at Aswan. Today, this dam is the most imposing feature of the area, doomed by biblical prophecy to be wiped out at some point between now and the Tribulation. “2 Son of man, set thy face against Pharaoh king of Egypt, and prophesy against him, and against all Egypt: 3 Speak, and say, Thus saith the Lord GOD; Behold, I am against thee, Pharaoh king of Egypt, the great dragon that lieth in the midst of his rivers, which hath said, My river is mine own, and I have made it for myself. 4 But I will put hooks in thy jaws, and I will cause the fish of thy rivers to stick unto thy scales, and I will bring thee up out of the midst of thy rivers, and all the fish of thy rivers shall stick unto thy scales. 5 And I will leave thee thrown into the wilderness, thee and all the fish of thy rivers: thou shalt fall upon the open fields; thou shalt not be brought together, nor gathered: I have given thee for meat to the beasts of the field and to the fowls of the heaven” (Ezek. 29:2-5). At first glance, this prophecy seems generically directed toward “Pharaoh, king of Egypt.” But upon further examination, its real target is, “… the great dragon that lieth in the midst of his rivers.” This scaly creature seems to represent the remnant of Egypt’s power, lurking behind the scenes since the days of Moses. In Ezekiel 28, the chapter that immediately precedes this one, Satan, as the “anointed cherub,” is shown as defeated. This prophecy in Chapter 29, then, may possibly be taken as an extension of that preceding prophecy. Here, the fish of the Nile River figuratively stick to the dragon’s scales, as all are hurled from the river onto its banks to rot and dry in the sun. His power is destroyed. The Nile, which annually flooded with clocklike predictability, has ceased its flooding since the construction of the High Dam at Aswan. Total destruction of this dam is the only way it could flood as catastrophically as described in Scripture. Interestingly, the huge dam is so massive that experts have pronounced it indestructible … except through the use of nuclear force. This fact alone makes it more than clear that this is a latter-day prophecy. With the foregoing in mind, it is interesting to examine two distinct biblical prophecies. As we shall see, they are related. But they evoke a mystery. They suggest that Egypt will soon experience a massive devastation that is unique to its geography. And apparently, for reasons that shall become clear, this event will predate Gog’s lightning assault upon Israel. In the last few decades, this arrangement has radically changed. The Russian hydroelectric project was amazing in its scope. It is huge, measuring 360 feet in height, 10,200 feet (almost two miles!) long and 3,200 feet wide at the base. Backed up behind it is the vast Lake Nasser, and the waters of the Nile that pool all the way into Ethiopia. The dam’s dimensions are so massive that it is considered indestructible. Saboteurs using ordinary explosives wouldn’t make a dent. However, experts have said that one or two well-placed nuclear bombs could blow it wide open. In Ezekiel’s day, Aswan (biblical Syene) was a small village, some 550 miles south of the Great Pyramid, on the bank of the first cataract of the Nile. It was considered the southernmost extent of Egypt. When Ezekiel wrote this prophecy, the entire area was geographically different. Of course, there was no “tower” there! Today, of course, there is the towering High Dam, which this prophecy indirectly names as the source of the great flood that will ravage Egypt. Ezekiel wrote his prophecy about 2,500 years, before its targeted object even existed, saying that it will break, allowing flood waters to surge almost six hundred miles to the north, where they would empty into the Mediterranean Sea. If nuclear weapons are used to accomplish this catastrophe, the floodwaters would cover all Egypt with nuclear waste. As we have mentioned in the past, this would account for the virtual abandonment of the country for the forty-year period mentioned by Ezekiel. This has never before happened. In 2002, Israeli Knesset member (MK) Avigdor Lieberman, admittedly a man given to controversial statements, announced that Israel could defeat an invading Egypt by bombing the Aswan High Dam. He knew that this would require the use of nuclear force, since many experts have testified that the dam is too massive to fall to ordinary explosives. Lieberman, who served as Israel’s Deputy Prime Minister, and as Minister both of Foreign Affairs and Strategic Affairs, had obviously been briefed upon military alternatives. It appears that he wanted to give Egypt something to think about. Nor was he alone in his opinion. MK Yigal Allon had publicly made the same statement during the early 1980s. A Labor Party representative, he too, had served as a government minister for seven years. These men were saying what others knew, but refused to speak about openly. They were simply stating the obvious. 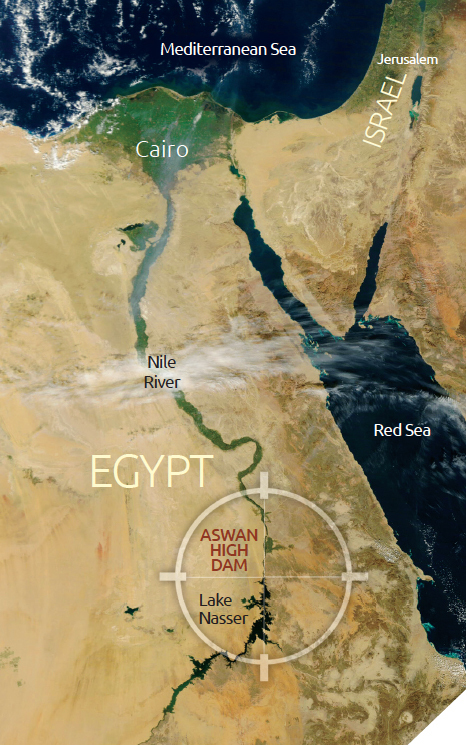 If Israel’s existence were threatened by an Egyptian invasion, drastic measures would be brought into play, The Aswan Dam holds back the waters of the enormous Lake Nasser, 340 miles long and 22 miles wide at its widest. If the dam were breached by a nuclear blast, radioactive waters would cover Egypt from Ethiopia’s Blue Nile, through Sudan to the Mediterranean Sea. Satellite photos reveal a staggering truth about Egypt. Virtually its entire population lives in close proximity to the Nile River, from Aswan all the way down to Cairo and the Mediterranean Sea. Night photos show the Nile as a narrow river of light that fans out at the Nile Delta. Egypt may be the only country on earth so vulnerable to total destruction. Naturally, when we read about the horrific event mentioned above, our first question is: When does this prophecy take place? In the following chapter of his prophecy, Ezekiel answers this question, too. “For the day is near, even the day of the LORD is near, a cloudy day; it shall be the time of the heathen. “And the sword shall come upon Egypt, and great pain shall be in Ethiopia, when the slain shall fall in Egypt, and they shall take away her multitude, and her foundations shall be broken down. “Ethiopia, and Libya, and Lydia, and all the mingled people, and Chub, and the men of the land that is in league, shall fall with them by the sword. “Thus saith the LORD; They also that uphold Egypt shall fall; and the pride of her power shall come down: from the tower of Syene shall they fall in it by the sword, saith the Lord GOD. “And they shall be desolate in the midst of the countries that are desolate, and her cities shall be in the midst of the cities that are wasted. “And they shall know that I am the LORD, when I have set a fire in Egypt, and when all her helpers shall be destroyed” (Ezek. 30:1-8). The language of this prophecy is unmistakable. A storm is gathering; the Day of the Lord is approaching. Note that not just Egypt, but all of northeast Africa is involved. Today, northeast Africa – Ethiopia, Somalia, Sudan, Chad and Libya – constitute a seething cauldron of Islamic terrorism. These countries surround Egypt, which is, itself, a seat of Islamic power. In spite of an intervening peace treaty, it has never deviated from its desire to eradicate Israel. In the prophecy above, Ezekiel states that all these countries will suffer judgment … including “Lydia,” representing modern Turkey. But the most devastating judgment of all is reserved for Egypt. Once again, the prophecy evokes the imagery of the “tower of Syene,” which we have pointed out as the Aswan High Dam. It seems to be central to all the judgments mentioned here. Egypt’s Islamic allies will also suffer greatly when the Lord sets His fire in the land of Egypt. It is clear that this fire is the instrument that will unleash the trillions of gallons of radioactive water that washes across Egypt. Many students of Bible prophecy have asked why Egypt is not listed among the allies that come against Israel in the great invasion described in Ezekiel 38. Certainly, Russia is represented, along with Persia and some of the countries of north Africa. Nations from parts of Europe and Asia are also represented, but Egypt is not among them. Under today’s geopolitical circumstances, Egypt would be at the head of the line in support of such an invasion, as it has been in the past. We would conclude that by the time Gog launches his lightning invasion, Egypt has already been destroyed. This would explain why Egypt is prophesied to be uninhabitable for a future period of forty years. This also explains why Egypt is missing in the prophesied attack on Israel by the allied forces of Gog, in Ezekiel 38. Clean-up of the radioactive debris would be a staggering task. This massive project seems to extend into the early years of the Millennium. But somehow, it will be accomplished in the years following the Tribulation, probably supervised by the Lord and His followers.